Our school lunches are failing our kids. Americans are becoming increasingly obese, and it's no wonder, when a whopping third of the vegetables children consume at school are potatoes. Currently, the National School Lunch Program provides over 31 million low-income students with free or reduced-price lunch. The Healthy, Hunger-Free Kids Act (HHFKA), which went into effect in 2012, requires schools that are part of the program to offer fruits, vegetables, and whole grains and also requires students to choose a fruit or vegetable with their meal. 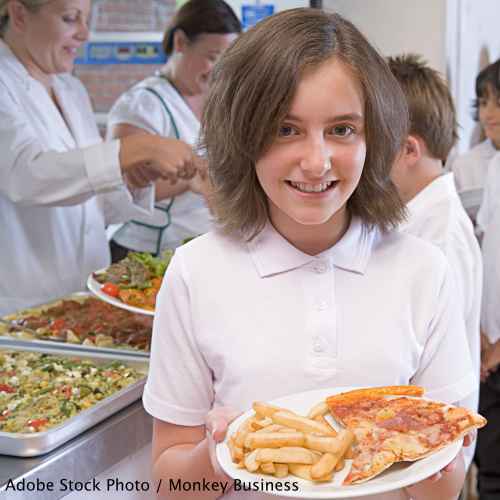 HHFKA increased the amount of money provided per meal to schools in the program by only six cents per meal to make to achieve these lofty goals, according to the NCSL (National Conference of State Legislatures). According to the Daily Beast, kids are balking at the food selection, food is being wasted, and some schools have dropped out of the program because they're losing money. One way to address this is the USDA's Farm to School Grant Program which has successfully funded 221 farm to school projects to date. The benefits of sourcing produce from local communities are numerous. It would teach children healthier eating habits at a young age; local farmers would have increased demand and therefore increased profits; new jobs for cooks skilled in preparing produce would be created at schools; the environmental footprint would decrease because the produce has less distance to travel from farm to table; and our local economies would strengthen. Sign the petition urging the Secretary of Agriculture to increase the budget for school lunches so that our local communities can offer healthy, well-prepared farm to table lunch options. The rates of obesity among children and adolescents in the U.S. are astonishing. In the past 30 years, the number of obese children has more than doubled, and the number of obese adolescents has quadrupled, according to the CDC. And it's no wonder, since 1/3 of all "vegetables" offered at lunch are some form of potato! Currently, the National School Lunch Program provides over 31 million, low-income students with free or reduced-price lunch, and that is fantastic — but the quality of those lunches is lacking. Schools need a bigger budget to locally source produce, but they also need a bigger budget to hire skilled workers who know how to turn produce from bland to appetizing. We need change. Kids, farmers, and communities nationwide would benefit from healthier, locally sourced produce for school lunches. Farm to school programs would teach children healthier eating habits at a young age; local farmers would have increased demand and therefore increased profits; new jobs would be created at schools to prepare the food in exciting ways; it would have a positive environmental impact; and our local economies would strengthen. This would allow us to change the way our kids look at food, and change the course of their lives in the process. You play a major role in this. We urge you to allocate more funds to our school lunch programs so that more schools can establish farm to table options. That's 5,536 signatures! Let's keep the ball rolling.